The Practix dye sublimation rotary heat model OK-06 is available in 26” or 48” wide printable widths. The solid state controlled heated drum is 6″ (150 mm) in diameter. This model can be used for transferring on continuous or roll materials. This heat transfer machine is small and affordable offering the Practix high quality innovative engineered design using a heavy duty frame, automation, and best quality electrical and pneumatic components like all Practix heat transfer equipment, including sublimation machines, lamination machinery and embossing equipment. 26″ (660mm) and 48″ (1220mm) Belt width allows easy digital dye sublimation transfer printing. 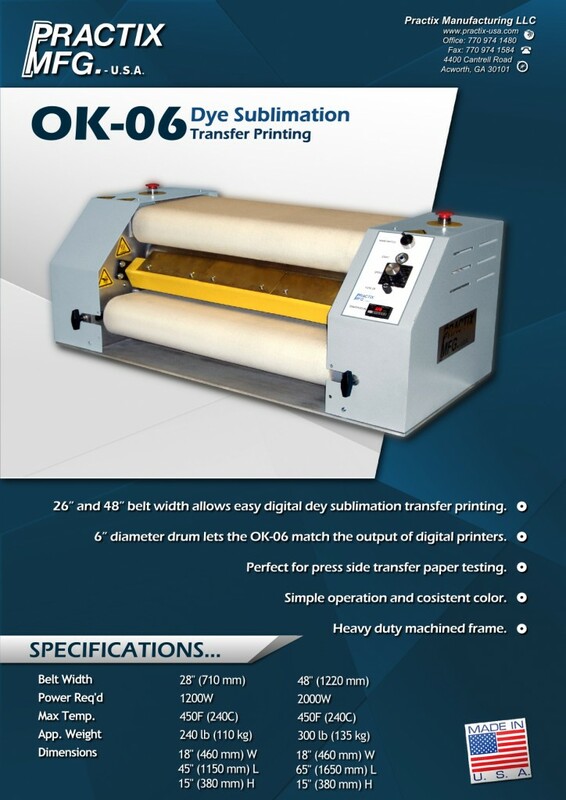 6″ diameter drum lets the OK-06 match the output of digital printers. Perfect for press side transfer paper testing. Our sublimation equipment is fully customizable to your desired size and color. All of our heat transfer machinery comes backed with a one-year mechanical warranty and a six-month electrical warranty. We offer next day shipping, so whether you run a furniture company in Phoenix or a sports apparel business in Shanghai, we can get you the machines you need fast.